Welcome... to Jurassic Park's best bet for a quality video game. Its developer has promised "the ultimate cinematic adventure," and judging by first shots of the new video game, it will be the prettiest Jurassic Park adventure yet. Game Informer has a first look at Telltale Games' Jurassic Park, which is not just "another dinosaur shooting game," according to its developer, but a story-driven game that takes inspiration from PlayStation 3 adventure Heavy Rain for its storytelling mechanics. 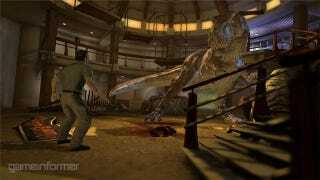 Given the episodic nature of Telltale's wares, a Jurassic Park game based on story, less on adrenaline fueled dinosaur chases isn't too surprising. Timing-wise, it appears to overlap lightly with the first Jurassic Park film and will draw on minor characters from the series, as well as original ones. Telltale Games recently released the first episode of its series based on Back to the Future. Jurassic Park is slated to come to the PC, Mac and unspecified consoles this year.